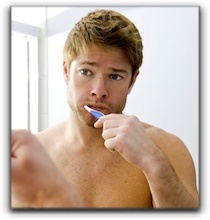 Regular dental check-ups and cleanings are essential for optimal dental health. However, some dental patients in the Sparks, Hereford, and White Hall area worry because their gums tend to bleed after a thorough cleaning. Is this a problem? Well, it depends. If your gums bleed for a day or two after your cleaning, it isn’t really a problem. But, if the bleeding and tenderness lasts longer, you really need to return to your Parkton dentist and discuss the possibility of periodontal disease. Periodontal disease, or gum disease, occurs when plaque builds up along the gum line. You might also experience bad breath, painful chewing, and loose teeth. Hi, I’m Dr. Craig Longenecker of Hereford Dental Health in Monkton. Avoiding gum disease is just one of the many important goals I have for my Parkton and White Hall patients. Along with optimum dental health, I also seek to give my patients the beautiful smiles they desire through cosmetic dentistry including porcelain veneers, crowns, dental bonding, and teeth whitening. Feel free to look us up on the web or call 443-672-2548 today.